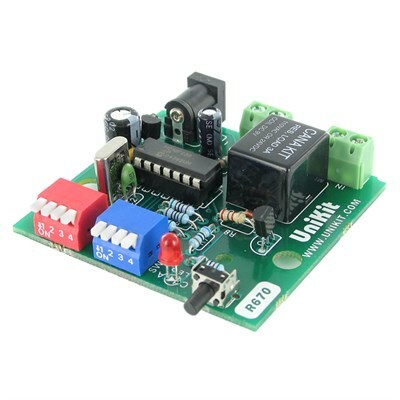 This PIC digital timer is precision cyclic (repeating On-Off-On-Off) timer based on a custom programmed Microchip PIC16F630 PIC Microcontroller that ensures a high degree of accuracy and flexibility. The timer allows both the On and Off periods to be set independently to a precise value through a set of DIP switches. Each DIP switch can be set to a value of 1 through 15 and can be configured to be in Seconds, Minutes, or Hours. As an example, the On period can be set to Seconds, and the Off period can be set to Hours. The On DIP switch can then be set to a value of 10, and the Off DIP switch to a value of 2, resulting in the timer being activated for 10 seconds, every 2 hours indefinitely. A custom case with silk-screened panels is also available under CanaKit part # BX670CY.